Tue., July 19, 2016, 7 p.m. It turns out there actually is truth to the old saying “as cool as a cucumber.” Even in very hot weather, the inside temperature of a cucumber always remains cooler than the outside air. Comprised of 95 percent water, cucumbers are good at keeping us hydrated. Full of antioxidants, they also help flush out toxins, boost immunity and increase energy. Cucumbers’ anti-inflammatory properties benefit the body inside and out. They really do help soothe puffy eyes and reduce dark circles. Full of skin-lavishing minerals like magnesium, silicon and potassium, cucumbers – when applied topically – also ease sunburns and cool hot skin after a day in the sun. Originating in ancient India, cucumbers have been cultivated for at least 3,000 years. They journeyed through ancient Greece and Rome, Europe, China and – in the mid-1600s – North America. Today, they are the fourth most widely cultivated vegetable in the world. Cucumbers are known for their dark green skin and long bodies, the kind found in mainstream grocery stores. But, like most produce, they come in a wide variety of colors, shapes and sizes. They belong to the botanical plant family called curcubitaceae, which includes melons and squashes, and are actually considered a fruit rather than a vegetable. While there are literally hundreds of varieties of cucumbers, they can be divided into three basic types: slicing, pickling and burpless. Slicing cucumbers include all varieties that are cultivated for consumption in their fresh form. These varieties tend to be fairly large in size and thick-skinned. Their size makes them easier for slicing, and their thick skin makes them easier to transport in whole food form without damage. Pickling cucumbers are cultivated not for consumption in fresh form, but rather for making into pickles. While pickling cucumbers can always be eaten fresh, their smaller size and thinner skins make them easier to ferment and preserve in a jar. Burpless cucumbers are sweeter with thinner skin, smaller seeds and less bitterness. Examples are English cucumbers, often shrink-wrapped for protection, and the mini-sized Turkish or Persian varieties, now easily found in upscale markets. But heirloom varieties offer up the most interesting flavor and textures. Lemon cucumbers – pale yellow in color, round and about the size of a tennis ball – offer sweetness with no bitter aftertaste, making them perfect for snacking. Just bite into one like an apple. Or, even more apple-like are crystal apple cucumbers. The size of a small apples, they are sweet in flavor, white in color, tender skinned, juicy and satisfyingly cool and crisp. In the kitchen, cucumbers often play second fiddle to summer’s other more showy bounty. Perhaps it’s because they are so familiar and common to us we take them for granted, not fully appreciating what they can bring to the table. With a fresh aroma reminiscent of summer rain, they add a calming element to our everyday dishes. Their crisp, watery texture adds lovely dimension to meals, while their flavor – subtly sweet, slightly salty, with grassy notes – provides just enough underlying bitterness to make them interesting and worth highlighting. Prep garnishes, finely dicing cucumber and shallot, slicing scallions, chopping herbs. Mix sour cream and water in a small bowl. To serve, divide chilled soup among bowls. Spoon a large circle or half circle of thinned sour cream, then top with optional prawn, cucumber, shallots, cilantro, scallions and micro greens or edible flowers. Serve immediately. Rinse cucumbers under cold water. If using Persian or English cucumbers, leave peels on. Using a mandolin or sharp knife, slice into thin uniform disks and place in large bowl. Add chopped dill, chopped mint and thinly sliced onions. In a small bowl, combine the rest of the ingredients – yogurt, sour cream, lemon juice, minced garlic, salt pepper, sugar and olive oil – and stir until smooth. Pour over cucumbers and stir to combine. Taste for salt and lemon, adjusting if necessary. Refrigerate until ready to serve. In a small pot or saute pan, bring vinegar, sugar, salt, pepper, mustard seeds and star anise to a boil. Add the finely sliced red onion. Simmer two minutes and chill in the fridge 20 minutes or until cold (you can do this the day before). When ready to serve the salad, thinly slice the cucumber with a vegetable peeler or mandolin. Slice one side (laying it down on a counter, peeling toward you), then flip over and slice the other side. Discard the seedy middle section. Place the cucumber ribbons in a bowl. Top with half the dill and mix. 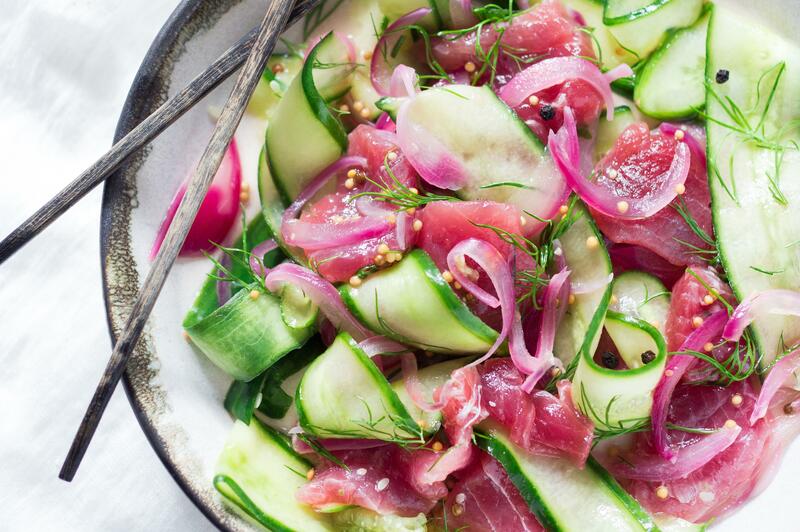 Cut the ahi, slicing ¼-inch thick, bite-size pieces, cutting across or against the grain, then toss with the onions and pickling liquid (make sure you’ve waited until it’s cold, and fish out the star anise pod) and toss to coat. Pour the ahi, onion and liquid over the cucumber ribbons, gently tossing. Using tongs, divide and arrange among bowls. Garnish with fresh dill and a drizzle of olive oil (optional). Published: July 19, 2016, 7 p.m.